Throughout history, doors have been an essential architectural feature of many buildings. The earliest doors were wooden panels that fitted over and provided access to tombs and crypts in ancient Egypt. In British history, doors have often been ornate and intricate. They have often utilised precious metals such as Bronze and have been used as a representation of the styles and fashions of the particular time in which they were made. The oldest “working”doors in England are the doors of Westminster Abbey and were established in 1050. As our homes have become more established and we attribute greater sentimental value to our belongings, in addition to their actual monetary value, it stands to reason that home front doors have become more secure and now have more functions than simply opening and closing to provide access and departure. Throughout modern history in Britain, the home front door has also been used to depict status and the personal style and taste of the occupant. For example, in Victorian times, many of the wealthier homes had a porch, and it was felt that the larger the porch, the wealthier and more affluent the occupants. The Victorian era also marked the first time many homeowners recognised that their front doors could help to keep out the cold weather and insulate the home. Doors of this era were well fitted and often had a curtain or covering to help to keep in the heat. Shortly before the end of the 19th century, the home front door began to use a glazed panel, in common with interior doors. To this day, such glazing remains popular, especially with the advent of shatter-proof safety glass, in addition to double and triple glazing that assists with insulation and energy efficiency. It was at around the same time that the personal style of the owner became more prevalent, as represented by patterns that were both carved into the surface of the wood and painted or printed on as decorations. Current trends for home front doors in Britain tend to highlight a wish for a blend of security, energy efficiency and stylish impact. 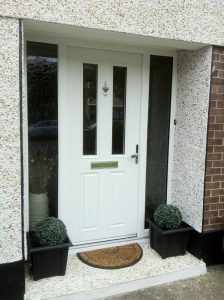 Choices for homeowners include UPVC, traditional hardwood and the most recent of door types – the composite home front door. There are many options available to homeowners for supply and fitting, with ready to hang doors being available that the owner can fit. Another option is a full service, which often includes a survey, the door itself and its fitting, together with various guarantees for the product and its workmanship.